We will first meet up at 9:30 AM at Bill Miller Plaza in the downtown campus of the University of Texas at San Antonio. 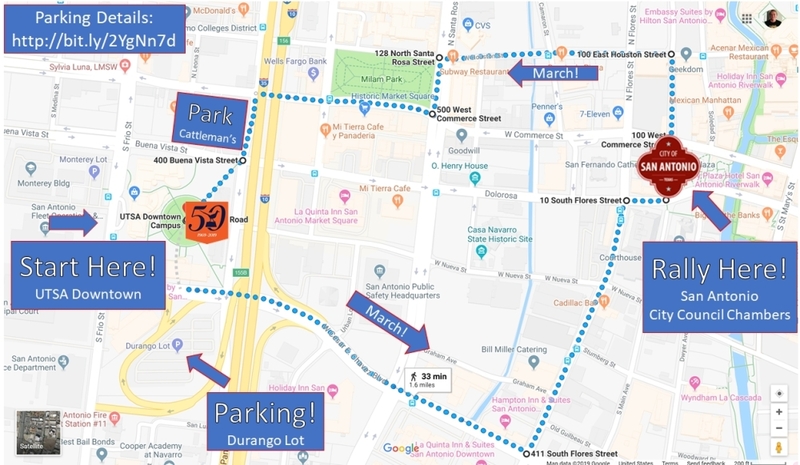 Parking for the March and Rally at UTSA is free and convenient to Bill Miller Plaza. The day begins with Welcoming Remarks by Alex Birnel, Advocacy Manager of MOVE Texas, building power in underrepresented youth communities through civic education, leadership development, and progressive issue advocacy. His address will include remarks directed towards Social Justice for San Antonio (SJ4SA), a program of UTSA's Student Leadership Center. March for Science - SA is proud to partner with MOVE Texas, SJ4SA and Texas A&M San Antonio in recognition of environmental justice and social justice issues found in the Climate Action & Adaptation Plan. Peter Bella, formerly director of the Natural Resources department of the Alamo Area Council of Governments and now a member of the Steering Committee of the Climage Action & Adaptation Plan (CAAP), is lead for March for Science-San Antonio. 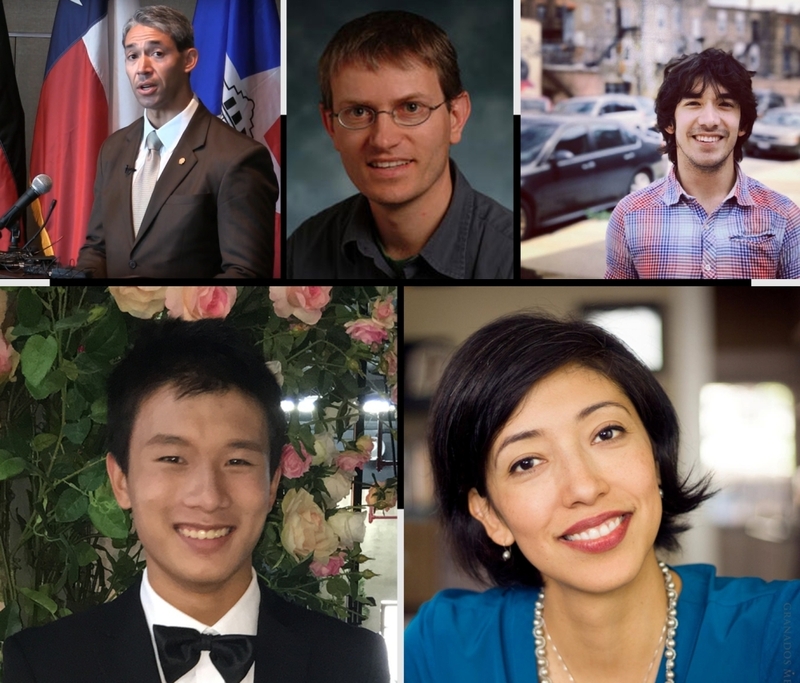 It is our pleasure to welcome four speakers to the Rally in Main Plaza during March for Science in 2019. They will offer their comments beginning approximately 10:30 AM. Matthew is a senior at Brandeis High School in San Antonio, Texas. He is the executive director and original founder of Ignition Green. Ignition Green has as its mission statement, to "mobilize, unite, and inspire K-12 youth for climate action. And we're built 100% by youth, for youth." Matthew’s passion for the environment stems from his frequent visits to the local park as a kid. He first learned of the dangers of fossil fuels when he visited his overseas family in Beijing, China. “The sky isn’t even blue over there,” he recalls. This led him to develop serious concern for the warming Earth, and since then, he’s been dedicated to fighting climate change and striving towards a sustainable future. He founded Ignition Green in May 2017 to help teens like him join the climate movement and create positive change. Matthew hopes that his work will inspire a new generation of climate activists. "While it cannot be our task as scientists to convince the unconvinced, or run a media campaign to reach a large number of the citizenry, we should feel obliged as scholars and are often mandated by federal law to reach out and communicate important findings to a broader public. ... We cannot presume any more that our scientific findings get translated into technical or societal progress by publication in scientific journals and popularization by a responsible and fact-based media landscape. ... I advocate for a more proactive approach of scientists in informing the public about climate change." It is likely that many citizens of San Antonio have not had the opportunity to meet or hear an air quality researcher speak directly on climate change. Given the urgency of global climate change, March for Science - San Antonio welcomes Dr. Schade to San Antonio. Ron Nirenberg is the mayor of the fastest growing U.S. city with the 7th largest population. As mayor, Nirenberg has focused on the challenges of significant growth being experienced in San Antonio, including transportation reform, housing, crime and public safety, and economic development. The Mayor and County Judge Nelson Wolff formed the nonprofit ConnectSA in 2018 to address the transit needs of a community expected to grow by roughly a million people over the next two decades. Members of the Mayor’s Housing Policy Task Force were appointed by the Mayor to assist with the development of a comprehensive and compassionate policy framework to address the pressing affordable housing challenges faced by San Antonio. But perhaps the City's most ambitious project under the leadership of the Mayor has been development of the Climate Action & Adaptation Plan. As mayor-elect, Nirenberg called upon the City Council to endorse the Paris climate accord even though U.S. President Donald Trump announced plans to remove the United States from the agreement. When the City Council convened for the first time on June 22, 2017, they voted to affirm support for the Paris Agreement. Under development since that time, the draft CAAP was published in January 2019 and is expected to go before Council later this year. Ana Sandoval brings an especially strong educational background to City Council, having obtained a B.S. from MIT in Chemical Engineering, M.S. at Stanford University in Civil and Environmental Engineering and a Master’s in Public Health from the Harvard School of Public Health. As a Fulbright Scholar in 1997-1998, she also obtained a Diplomado in Binational Business from the ITAM in Mexico City. This background provides her with a special set of tools in providing guidance as Chair of the Community Health and Equity Committee on City Council. Time spent working in the San Francisco Bay Area Air Quality Management District in air quality and climate change, environmental justice, and public information and engagement programs, and with the Harvard School of Public Health and the UT School of Public Health San Antonio on environmental health research projects inform her engagement with and support for the Climate Action & Adaptation Plan. Her closeness to her neighbors in District 7 mark her tenure on council as well. She brings attention to improving public and pedestrian safety through the city’s Vision Zero initiative. Her insight is not lost in recognizing the value of working proactively to reduce health and property risks due to climate change for the city and the people of San Antonio. With the conclusion of the Main Plaza Rally, Peter Bella will offer closing remarks. The march itself will be along the streets, sidewalks, and parking lots in the immediate area, and is just over a mile and a half total. That said, please do not overexert yourself. The Rally with featured speakers will take place on the highly-accessible Main Plaza in downtown San Antonio. Our goal is for this march to be as accessible as safely possible. Parking will be free and available in the parking lots administered by UTSA. Please visit the information online for parking. From Bill Miller Plaza of the downtown UTSA campus, we will head southeast on Cesar Chavez Boulevard and turn north on South Flores Street. When Flores meets Dolorosa Street, we will walk about a half block and enter Main Plaza. The Rally will take place on the north end of the plaza on the steps of Municipal Building, which function as City Council Chambers. With conclusion of the Rally, we'll march north along Main Street to East Houston Street, where we'll turn left to walk to the west. We'll move south of Milam Park and continue to the west along Commerce Street. Finally, we'll head south along N. Pecos - La Trinidad Street to rejoin Bill Miller Plaza. This march has created a very diverse coalition of individuals. The energy will be super high, please be respectful to others as well as to our San Antonio streets. Parking for the March attendees begins at UTSA downtown. Parking directions here: http://bit.ly/2YgNn7d Partnering event, Social Justice for San Antonio (SJ4SA), begins at UTSA downtown campus indoors. March for Science - SA 2019 Begins at UTSA's Bill Miller Plaza! Official Welcome and Remarks by Alex Birnel of MOVE Texas and Peter Bella of March for Science - San Antonio about 9:45 AM. SJ4SA students from UTSA and Texas A&M -SA join the gathering. Main body of the procession arrives at Main Plaza. Tables, events, DJ music, booths are underway on arrival of marchers. Executive Director of Ignition Green (http://ignitiongreen.org/) speaks about his fellow high school students and their work to spread climate awareness as part of a growing global youth movement. Dr. Gunnar Schade from Texas A&M's Department of Atmospheric Sciences will give his perspective on the role of scientists in speaking out on topics, such as climate change, which some consider controversial. The Mayor has provided the leadership and guidance necessary to bring the Climate Action & Adaptation Plan to its draft stage, and will discuss the need for planning for the future with climate change in mind. Councilwoman Sandoval is a key leader on City Council in bringing the Climate Action & Adaptation Plan to San Antonio. She will discuss what climate planning means to the south central Texas region. Closing remarks by Peter Bella of March for Science - San Antonio. Procession returns to UTSA. We wrap up another great and important event for 2019!